Ever wonder getting a tab or mobile for just uploading slefie. Here is a cool contest from Jacky's. 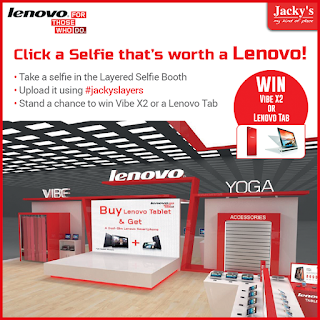 Visit the Jacky's Lenovo stand at Gitex Shopper today until Saturday, click a Selfie and stand to win VIBE X2 or Lenovo tab! Click here to know more details and to Vote for me as well!! !